Hello again, goodness 2017 is already off to a flying start. 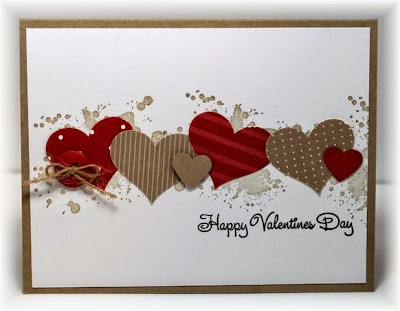 With Valentines Day on 14th February and Mother's Day hot on the heels in March, the 26th to be precise there are plenty of opportunities to get creative. I also have a family birthday, the day before Valentines Day when my eldest, my son Adam, will be 27. For today though, I thought I'd best concentrate on Valentines Day cards. I don't know about you, but I much prefer clean simple lines - even humorous - but most definitely not soppy and slushy. 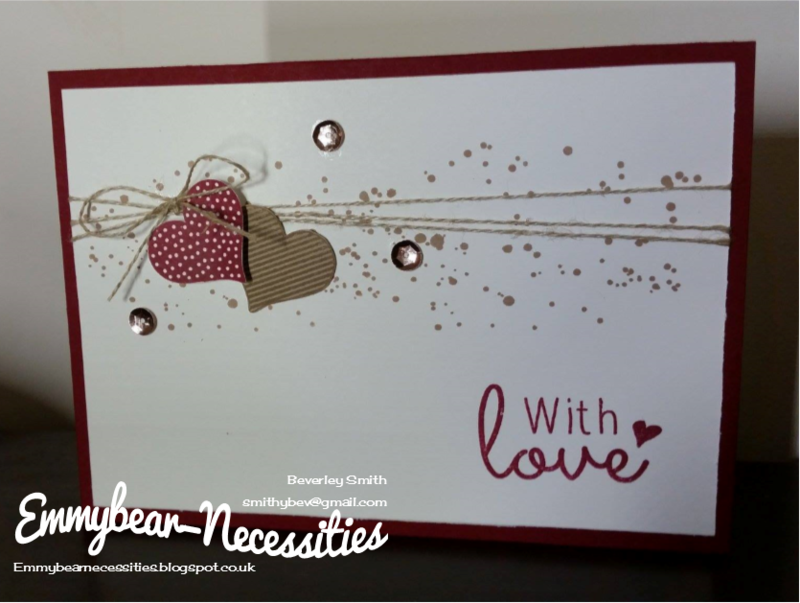 For today's card I took inspiration from Becky at Scrappin and Stampin in GJ after I found her card on Pinterest, so thank you Becky, I hope you like what I've done with your original idea. ...and passion, desire, strength and power! I used Crumb Cake on the splatter stamp from Gorgeous Grunge and randomly placed on the upper part of a piece of Whisper White cardstock. I then wrapped some Linen thread around and tied a bow. 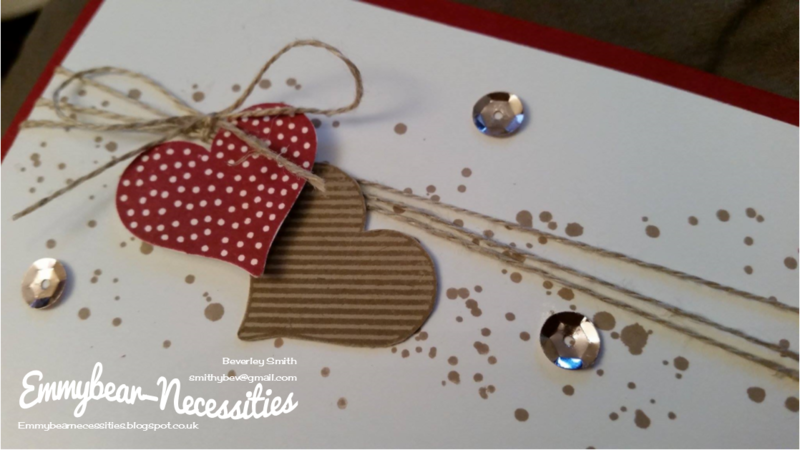 For the next step I used 2 of the heart stamps from Hello Love, now discontinued. 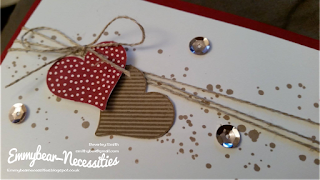 I managed to fussy cut both hearts (I'm really not a lover of having to fussy cut! ), sticking one directly onto the white card while the other was raised slightly by using a couple of dimensionals. A very simple sentiment, with love - not by Stampin Up - balanced the card. I also thought that 3 of the soft gold sequins from Fancy Frost Sequins would add just a little understated bling. As I'm sure you know, whenever adding embellishments like sequins, pearls or gems it's better to use an odd number, just like you would when putting plants in the garden.